HAIX Triple Threat is HERE! 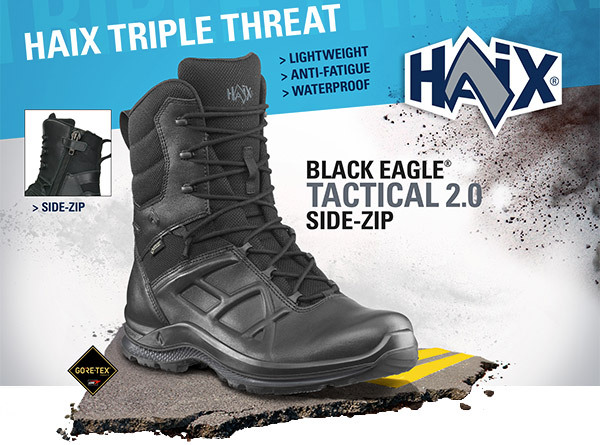 HAIX® is excited to announce the addition of the Black Eagle® Tactical 2.0 GTX High Side Zip! These boots are fully manufactured and designed by HAIX® in Europe. The Black Eagle® Tactical 2.0 GTX High Side Zip is built with trail running technology so they are perfect for running down a suspect or for just taking a walk in the park. The soles have excellent grip on uneven terrain and are comfortable even when worn for long periods of time. PU is injected into the sole for optimal comfort and heat insulation. The upper material is made of waterproof bullhide leather and soft microfiber design with a Sun Reflect Technology that keeps the feet 20% cooler in direct sunlight compared to other leather boots. The inner liner is also waterproof and breathable with GORE-TEX®. The two-zone lacing system allows to get the perfect fit, and once achieved, you can just use handy side zip feature to zip up and go! These lightweight, breathable boots, are now in our warehouse waiting to ship straight to you!